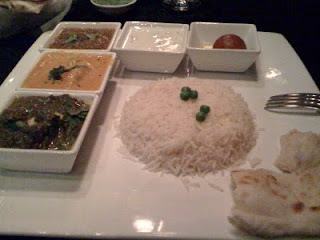 So yesterday Stephanie and I went to dinner at Tamba out on the strip. It's kind of in a back area place that I probably would have never found if she hadn't driven us there. We were meeting up to discuss our idea for a cooking club (The Stephanie & Heather Project - if you're on FB, local to Vegas and want to join let me know and I'll send you an invite) which we are starting but I did take a couple pics of my food. 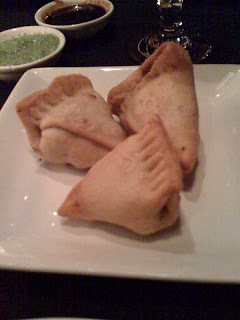 These were the Vegetable Samosas and they were really yummy. There were actually four but I gobbled one down before I could take a picture of them. And those yummy Samosas came with my Buddha Feast. It was a great deal because you got the rice, 4 different dishes, nan and the "dessert of the day" which is that reddish brown looking ball in the top right. It was some sort of dough with a honey on it and it was good. I really liked the either cheese or tofu that was in the green one on the bottom. Yes I am aware it looks gross but it's spinach and some other stuff. It was good. I really liked the bright orange one though. It had some other veggies in it and it was just a bit spicy so it was tasty. The brown one on the top left was a lentil dish and it was ok and then there is the white sauce which tastes like the cucumber sauce you get at a Greek restaurant. YUM! With the fresh nan it was just delish! And believe it or not I had enough left for my dinner tonight. MMM!!! I took this picture from where I was sitting in our booth. 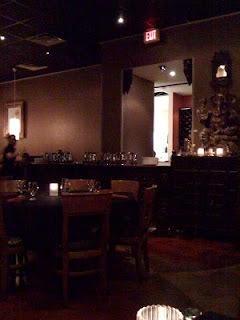 The restaurant is very nice and well decorated. I thought it was kind of cosy and would be fun to go there on a date. Plus it's something a little different and kind of exotic so it's exciting. We had a coupon from the Entertainment Book which gave us a buy one get one deal which made it VERY affordable for us. Stephanie had the other Feast option which was a little more expensive because it had meat and mine was veggie but with the coupon we got out at about $15 a person. If you had to pay full price it might be a bit much but that Entertainment Book coupon definitely makes it worth it. I think even at full price it would be a fun date night. I'd definitely go back because it was fun and yummy.